I was one of the people who was present at the Calcutta Club on November 2017 for the Kolkata-launch of the Democracy’s XI, The Great Indian Cricketing History, written by Rajdeep Sardesai. Besides the author, who is also a renowned journalist based out of Delhi, the other two people present at the event were former India captain, Sourav Ganguly and the famous cricket historian, Boria Majumder, who was also the moderator for the evening. It was a memorable 2-hour in which a lot of cricket stories related to various players including Sourav and his teammates were shared. One of the things you can look to do at a book launch event is to get your personal copy signed by the author. I, being no exception, got my copy signed by Rajdeep Sardesai at the end of the event. However, I didn’t read the book straightaway. It was there, lying around on the shelf for some time before I could get to it finally after a few months. The book, as the cover pretty much gives away what it is all about, is a collection of short biographies about eleven Indian cricketers who, according to the writer, made a mark during their tenure as a player and changed the course of cricketing history in India. 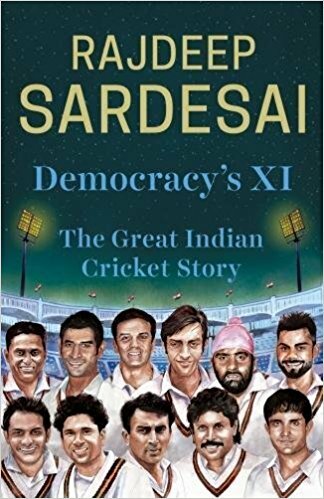 The players who find a place in Sardesai’s Democracy’s XI are: Dilip Sardesai, Mansur Ali Khan Pataudi, Bishan Singh Bedi, Sunil Gavaskar, Kapil Dev, Mohammad Azharuddin, Sachin Tendulkar, Sourav Ganguly, Rahul Dravid, Mahendra Singh Dhoni and Virat Kohli. The fact that this team doesn’t have a proper bowling attack suggest that the eleven individuals were picked keeping in mind their contribution towards making the game and not with an intension to pick an all time playing eleven for India. Cricket is probably the only thing in India which unites people. And the Indian Cricket Team embodies the very idea of our nation, which is inclusiveness. The Indian team comprises of players from different parts of the country, different social strata, varied religion, caste and creed. Yet, when they represent their country they are one team. One nation. It is this very idea of oneness that cricket reflects is what the author tries to capture in this book. Through the eleven players, who are the leading characters in his narrative, he tries to bring out the social, political and economic changes that India has gone through post-independence. The author, who had mostly penned political books prior to writing this one, decided to choose cricket as the topic of his book so that he could portray how cricket has stood out among other sports and transformed over the years, symbolizing the change in societal structure in India over the years. “In the 1970s, Gavaskar had given Indian cricket self-esteem, in the 1980s, Kapil Dev gave it excitement, in the 1990s Sachin gave it stature; now the Kohli millennium generation has added a new word to the lexicon: dominance.” Sardesai very aptly puts at the end. The book unveils various facets of these eleven players; however, most of the cricketing facts mentioned in the book are not completely alien to an average cricket fan in India. All these cricketers have dedicated memoirs or biographies to their names. However, where this book tries to be different is in its narrative approach — the book has a high concentration of anecdotes which he collected by interviewing various former players and journalists and quoting from already published works. My personal favorite are the chapters on Dilip Sardesai and Mohammad Azharuddin. Nepotism notwithstanding, author’s take on his father, Dilip Sardesai is filled with emotion and realism. And, it is also very personal. Coming from Margao, Goa, which is not a traditionally a cricket playing state, and representing India was never easy. Dilip Sardesai had to cross all hurdles varying from financial, logistical and infrastructural. In this chapter, the author successfully reveals the pulse of the country during the 1960s and how the people outside looked at cricket as a sport. Cricket at the time was treated more in an “amateur” spirit with lack of money, as opposed to what we see now when millions of rupees are spent on single cricketer. The chapter on Mohammad Azharuddin is a thrilling read. For a man who has had a career with ups and downs, in real sense of the terms, a chapter on him can’t be anything less than interesting. The author, with several anecdotes and often quoting from Azhar’s biography by Harsha Bhogle, maintains a firm balance between his on-field laurels and off-field controversies. The book is a decent read overall and stands out in documenting the progression of Indian cricket over the last five decades.